First, it was The Favourite. Then, Us. Last weekend, it was Saturday Night Live. For months now, rabbits—those cotton-tailed mammals beloved by Of Mice and Men‘s Lennie and 4-H kids—have been appearing on-screen in varied roles. Not soft or cuddly, but symbols of danger and malice. What happened? Did we—The Culture™—collectively decide bunnies were the creepiest creatures of the moment? If so, what act of evil have they done to deserve this? Have we imbued our furry friends with false meaning or are they actually, secretly vessels of villainy? These questions rattled my brain and wouldn’t leave. I was determined to find out. In Us, Jordan Peele’s horror Rorschach about nefarious, revenge-consumed doppelgängers looking for something akin to class sovereignty, thousands of rabbits eerily populate the underground tunnels where legions of clones reside. They are, from the long opening shot until the end, presented as avatars of menace—just as Peele intended. “Rabbits, they’re supposed to be cute,” he told Rotten Tomatoes. 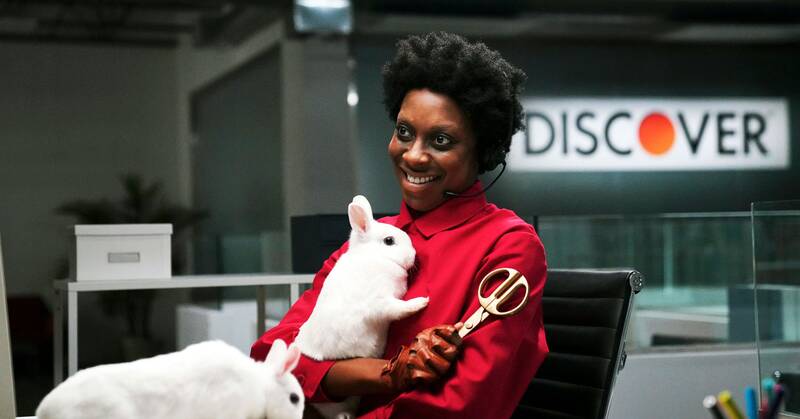 “[But] you can tell in their eyes they have the brain of, like, a sociopath.” His hunch about hares proved spot-on; rabbits (along with scissors, racing gloves, and red jumpsuits) became such an indelibly haunting aspect of his film they were a punchline in Saturday Night Live‘s sketch last weekend parodying it. With The Favourite, the Grecian absurdist Yorgos Lanthimos focused his lens on a lattice of political eroticism wherein two ingénues vie for the affection and ear of Queen Anne, an emotionally erratic British monarch whose health is failing. With meticulous care, Anne keeps 17 rabbits—”my babies,” as she calls them—in tribute to the 17 children she’s lost through the years. “Some were born as blood, some without breath, and some were with me for a very brief time,” she explains to a confidant, who later, in one of the film’s more intimately sadistic scenes, squashes a rabbit in an act of pure calculation, proof of her newfound power. The confession and bloody moment lend the rabbits a cursed, almost unholy air. As with Us, they come to occupy a strange, freakish province of thematic double meaning that has re-emerged in pop cinema, inviting representations of cartoonish virtue as much as they do fanged malevolence. Like clowns and kids, they are benign beings Hollywood has wrought wicked. I was still curious. How does that understanding relate to real life? Us, The Favourite, Donnie Darko—they’re all accounts of fiction (pieces of The Favourite were inspired by Queen Anne’s sinuous, and very real, relationship with Abigail Hill and Sarah Churchill, but much of the film reads like dark farce). Rabbits have become cultural totems in movies, but are these silver-screen fuzzballs, however blood-hungry or sweet, in fact reflections of a real, subconscious cottontail consternation? What is it about the rabbit that makes it such an oddly striking symbol of light or imminent death? Are rabbits actually capable of malice? I decided to consult Google (as we millennials are known to do). My initial search for “Are rabbits evil?” returned a lavish, and surprising, 15,300,000 results in 0.47 seconds. Amongst those finds I was greeted with headlines that screamed “7 Reasons Why the Easter Bunny is EVIL! Seriously, LOL” and “Proof That Every Rabbit in the History of Cinema Has Been Evil.” Every rabbit? In the history of cinema?? Color me intrigued. Sung did have one suspicion, however, as to why rabbits get such a bad rap in popular culture in spite of their natural gentility. “I think rabbits may be portrayed as evil for the dichotomy, since they are typically perceived as prey or being helpless and harmless. Think of the Easter bunny.” OK, sure; but the Easter bunny is definitely spooky.